(Nanowerk News) As an actress, producer, director and theatre arts lecturer at The University of Texas at Arlington, Julienne Greer knows the techniques that help draw people’s deepest emotions to the surface. Now, she’s building on her experience and research to help scientists and robotics engineers better understand the human experience so that they can build more responsive robots. SoftBank robot Pepper is expected to sell at U.S. stores by summer 2015. Greer, who holds a master’s degree in media arts and a doctorate in humanities, recently authored the paper, “Building emotional authenticity between humans and robots.” In it, she referenced a robot named ‘Pepper,’ which has been widely hailed as an emotionally responsive humanoid robot that understands feelings, and is meant solely to emotionally interact with people. 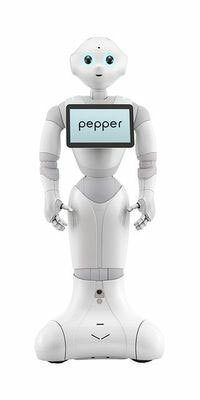 When Pepper was unveiled in Japan in June 2014, SoftBank CEO Masayoshi Son said that his company’s aim was to “develop affectionate robots that can make people smile.” In her paper, Greer noted in response that when humans make certain gestures, such as a smile, it could mean that they are “happy.” It could also mean that they are “angry,” but smiling in order to make themselves less aggressive in tense situations. Scholars intrigued by Greer’s work, invited her to present her paper at the Sixth International Conference on Social Robotics held in Sydney, Australia last month. They also requested that she lead attendees in a session on enhancing the relationship between human beings and emotional robots. Greer’s expertise is in the performance technique method acting, so she led the workshop attendees through several brief method exercises. One exercise consisted of verbally guiding the participants through the re-creation of drinking a beverage through the engagement with and discovery of individuals’ sensory responses. During the question and answer session afterwards, many of the participants spoke about their experiences. One learned their strongest sensory response of the re-creation of the beverage was the weight of the liquid in the glass and how the balance of the glass was altered as the liquid swirled within it. “The fascinating aspect of sensory work is how it opens the imagination to the cognitive work our senses do all day, every day to connect us to our world. The subject becomes aware of new sensory stimuli, which in turn creates an emotional response.“ Greer said this is significant. The categorization of behaviors or gestures and an understanding of how they create specific emotions in humans will allow the engineers and roboticists to apply those gestures and behavior to the programming of robots. Beth Wright, dean of the UT Arlington College of Liberal Arts, said that Greer’s research demonstrates the many opportunities for the arts and sciences to work together. The plan now is for Greer to develop a data-capturing test that would among other things, find out the response of humans to robots confronting a variety of circumstances. Greer’s current studies stem from her research into the emotive connection between humans and their video game counterparts. Her 2011 paper, “Digital Companions: Analyzing the emotive connection between players and non-player character companions in video game space”, was published by Inter-Disciplinary.Net, a global network of people, projects and events.